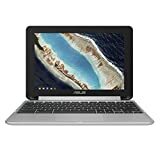 ASUS Chromebook Flip C101PA 4GB RAM Quad Core for sale. If you are looking for value, than this Chromebook is it! Powerful, super fast, sleek and affordable make the ASUS Flip C101 the perfect choice.